Remove the inner piece... and put it back to the original position. This cube is a maze through which a loop was interwoven. 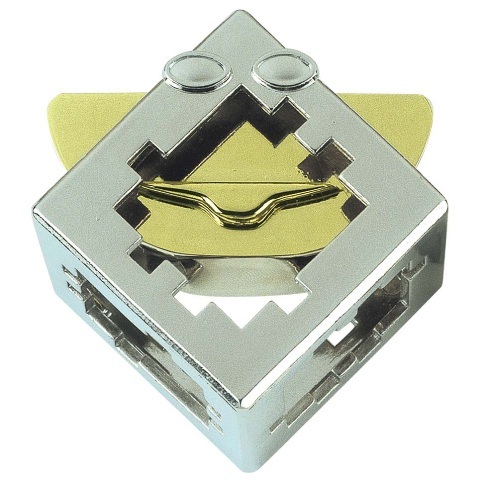 The position of the piece trapped inside can be changed by it being moved in a unique way. However, the dilemma is…how you remove that piece. When first invented, the start point at which the piece can be removed was not fixed. However, following a suggestion by the late Mr. Nob, the furthermost position was made to resemble a face, and a clear removal start point was thereby designated. Designed by Oskar van Deventer. Level 3/6. Package size: 7,5 cm x 11,5 cm x 4,5 cm.